It's Christmastime in Port Sentinel, the tiny English town where Jess Tennant has been living for more than a year now. Jess wasn't sure how she felt about moving to Port Sentinel when her mom dragged her there right in the middle of high school, but even Jess has to admit the town has completely outdone itself for the holidays. There's a Christmas market complete with a mini ice-rink and fairy lights, and the bare trees stand stark against the sky. But for Gilly Poynter, one of Jess's classmates, the Christmas season is anything but magical. She's disappeared, leaving behind only her diary and a lot of questions. Has she run away from her unhappy home, or has something more sinister happened? And will Jess be able to find her before it's too late? Hide and Seek is another cleverly crafted, charming mystery from acclaimed author Jane Casey. JANE CASEY was born and raised in Dublin. A graduate of Oxford with a master's of philosophy from Trinity College, Dublin, she lives in London, where she works as an editor. 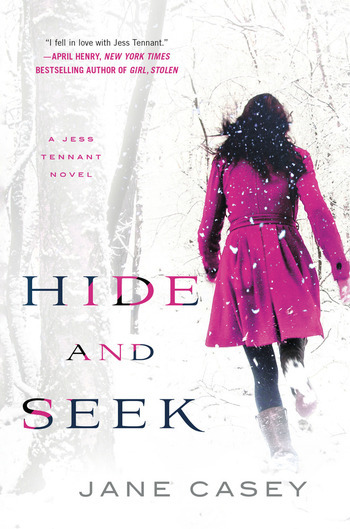 Hide and Seek is her third young adult novel.